My wife & I sailed on 1/12/19, Our 6th Windstar cruise, 3rd on Wind Surf. Room 126. The ship – Wind Surf – was built in 1990, and is showing its age in too many areas. Rust, loose planks, paint peeling, bent railings, and I could go on. The most odd part is that I didn’t see any maintenance crew guys doing repairs. Which to me means that there is something else, a problem that goes deeper but I don’t know what it is. Maybe it’s the cruise Captain, or it’s the upper management cutting back on costs, I really have no idea. Also, FYI – Windstar Cruise line is pulling out all the casinos. Which means that in the evening, for entertainment outside of your cabin, your only choice will be the band, or duo. That’s it. Granted the casinos are rarely filled, and are never very lively – but that’s the casino staff’s responsibility and they fail here. And it gives you another form of entertainment. The other crew members – bar, serving, house-keeping staff all seemed to be a little less friendly this trip. What’s going on ? Some were good though – Maria, Ace, Mel, and Eugene were great bar people. Alex was a super room steward. But other than those 5, everyone seemed a bit agitated, or distracted. The people/fellow passengers seem to always consist of “my kind of people” unlike the larger ships. Almost everyone is friendly, classy, and talkative. Again, this was now our 6th cruise and we have never had a problem with our fellow passengers. This sailed of St Maarten, 7 nights, 1 sea day. I didn’t really care for the sea day but I certainly got a great tan. The ports were all good, as always. A bonus I thought was that the normal stop for the beach party was still in ruins, so they parked at a different side of the island. And this stop was a short cab ride to the Baths. No tour needed. All in all, we had a great time. But I expected a little more. View from the back of the ship. My wife & I sailed on 1/12/19, Our 6th Windstar cruise, 3rd on Wind Surf. Room 126. The ship – Wind Surf – was built in 1990, and is showing its age in too many areas. Rust, loose planks, paint peeling, bent railings, and I could go on. The most odd part is that I didn’t see any maintenance crew guys doing repairs. Which to me means that there is something else, a problem that goes deeper but I don’t know what it is. Maybe it’s the cruise Captain, or it’s the upper management cutting back on costs, I really have no idea. Also, FYI – Windstar Cruise line is pulling out all the casinos. Which means that in the evening, for entertainment outside of your cabin, your only choice will be the band, or duo. That’s it. Granted the casinos are rarely filled, and are never very lively – but that’s the casino staff’s responsibility and they fail here. And it gives you another form of entertainment. The other crew members – bar, serving, house-keeping staff all seemed to be a little less friendly this trip. What’s going on ? Some were good though – Maria, Ace, Mel, and Eugene were great bar people. Alex was a super room steward. But other than those 5, everyone seemed a bit agitated, or distracted. The people/fellow passengers seem to always consist of “my kind of people” unlike the larger ships. Almost everyone is friendly, classy, and talkative. Again, this was now our 6th cruise and we have never had a problem with our fellow passengers. 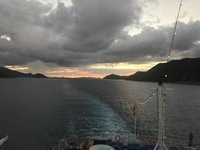 This sailed of St Maarten, 7 nights, 1 sea day. I didn’t really care for the sea day but I certainly got a great tan. The ports were all good, as always. A bonus I thought was that the normal stop for the beach party was still in ruins, so they parked at a different side of the island. And this stop was a short cab ride to the Baths. No tour needed. All in all, we had a great time. But I expected a little more. Has a very nice Yacht Club at the dock, on the second floor. Always Soggy Dollar & Hendo&apos;s Hideout in the morning, then Foxy&apos;s at night - AWESOME day. Had never been. A new beach bar is set up, and was very nice. Morning walk took us to some shops & Le Select, then at noon to Nikki Beach. Simply said - another great day.